Finding new dance music, how can DJs find music downloads others missed? When I came back to Djing after an over 10-year hiatus I was really struggling to discover and keep up to date with new dance music downloads because of my broad music tastes and the sheer volume and choice that was around. I wasn't comfortable with people's suggestions of just following DJ dance music charts to source my new music and I had really fond memories of the "old days" when I used to bury myself in mountains of records like a ferret in a rabbit burrow hunting out that elusive killer track. I think this picture of a good friend of mine sums it up perfectly. Those that have done this will know the pure ecstasy of discovering that special track we hope no-one else knows about. Imagine that picture if we were digging through all the digital dance music downloads in the same way, it would look more like trying to search for a black cat in a coal mine. I still agree there's nothing like the "feel" of vinyl, looking at and caressing the sleeve of our new-found prized artefact. Nevertheless it's been time for us to face facts for a while now, if we want to stay upfront with our music then digital is the way forward. So here's how I've tried to recreate some of that magic to at least give us a fighting chance of staying in touch with the latest dance music releases. A real way of staying upfront and finding those lesser known and special tracks other DJs might so easily miss. There are so many different music download sites on the web, who for the most part sell the same releases. I couldn't pick one site to stick with because I was aware each has its own exclusives, and it's the thought of potentially missing a diamond that spurred the idea. So, first I needed to grab music from as many of the sites as possible. That solved the problem of jumping around the net visiting loads of sites and having to plough through the same stuff over and over in the hope of stumbling across the occasional exclusive! I gradually realised that the music sites don't release tracks on the same day now, of course not, that would be too easy! So, I'm having deja-vu again and listening to tracks I've already heard. Luckily this was an easy one to solve, I needed something to note what I've already listened to, so if a site releases a track I've previously heard it won't appear again. At this stage it starts to get manageable! So I've solved lots of problems, I've now got a dance music playlist of tracks that I know sits in a genre I like. I don't have multiple copies of the same track and each one is something I haven't heard before; now we're at nirvana aren't we? Well actually we nearly are yes, but those producers and labels are busy people these days so there's still lots to listen to especially when our music tastes are broad like mine and we like quite a few genres. 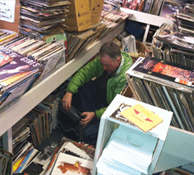 Here's where I really tried to recreate my old style of scanning through the vinyl releases. I used to stick a record on the deck, skip the needle across to get a general feel and place it on a shortlist pile if it pricked up my ears. Once I'd got a pile of "maybes" then at the end I'd listen to them properly before making my final choices. We've all come across those tracks with a great melody but horrible vocal etc. So unsurprisingly I needed shortlist and skip functions. However we're still not there, there's loads more music available than there was back then and it was still time consuming especially for me as I like lots of genres. So I had the brainwave that it would be great if someone could do that for me, like a personal assistant. So I created a fast listen mode which plays all the tracks on the playlist and automatically skips through them based on the minimum duration I thought I needed to hear to get a general feel. I wanted to be able to leave it playing in the background while I do something else and if something catches my ear then bang I can quickly add it to my shortlist. This was final piece, and now I had a tool that made discovering great new dance music much more manageable and enjoyable! I can truly say without Trackhunter it would be impossible for me to find the music I do. It lets me listen to dance music when I want with the confidence that I need not miss anything, it saves me so much time as well as money. I do not have to settle for tracks that are, in my mind, just OK, which as a DJ won't get us very far these days. I'll be the first to admit Trackhunter has its shortcomings, there's plenty of ways it can be improved and I'm working on that but it does already present a very unique and helpful way to discover quality new dance music online.